The Unibind SteelBinding Systems are fast and easy to operate. They use a thermal heat binding process that produces great looking reports. Unibind offers a wide variety of spines and covers to choose from. 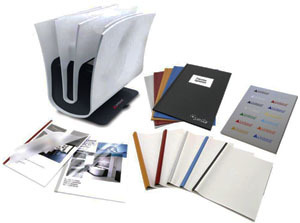 Easy to operate simply place the pages into the UniCover Flex, UniCover Spine or UniCover Hardbook Covers, then place the document onto the Unibind Binding Machine. It's that easy. There is no need for punching paper. The Unibind Binding Machines allow you to bind from one to fifty documents at a time. The system will bind books up to 340 pages. These units allow you to edit pages quickly and easily. The Unibind Binding System is a great time saver. SPECIAL SALE PRICES NOW ON ALL UNIBIND SUPPLIES . FREE SHIPPING ON ALL UNIBIND MACHINES. Entry Level Machine for Small to Medium Offices or Home Use. Uses Unicover Flex, Spines and Hardbook Covers. Will Bind from 1 sheet to 60 sheets of 20 lb paper. Bind, Crimp and Cool in Seconds with this Maintenance Free Thermal Binding System. Capable of Binding from 1 up to 120 sheets using Unicover Flex, Spine, or Hardbook Covers. Can Bind up to 340 pages using Unicover Flex, Spines or Hardbook Covers. Super Strong Bond and an Automatic Crimping Feature. Specifically Designed to Provide you with a Complete Working Station.